We made some fun festive 4th of July themed treats, they turned out wonderful, and were so simple for the kids to help make on their own! Have fun making your own Red White and Blue easy snacks!! We made some festive rice Krispie treats, we doubled the batch. With the first batch we used star cookie cutters for star rice krispies, and then decorated with red, white, and blue sprinkles on top. With the second batch we cut out rectangles, decorated to resemble the USA flag. The rice Krispie treats ready all ready to go! We ended putting the stars and flags on popsicle sticks. We also made some red, white, and blue fruit skewers, which the kids loved! We used watermelon, and red grapes for red, blueberries for the blue, and bananas for the white. 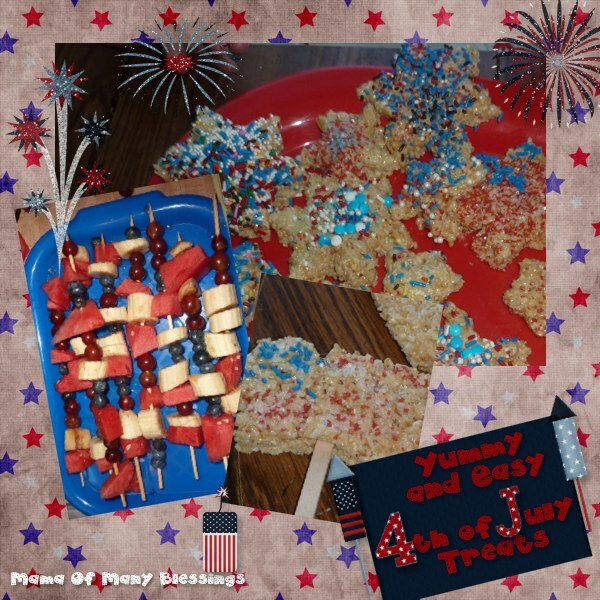 Enjoy making your own red white and blue easy snacks idea for kids! Stop by all the other blogs I am linked up with for other great ideas to try with your kiddos! Yum! I am in seach for treats to make that won’t heat up the kitchen. These are perfect! These all look great!! Thank you for sharing at Sharing Saturday! I will be featuring these tomorrow for my holiday round up! I love the pop cycle stick idea. Keeps those little fingers less sticky. very cute – my kids would love to have a go at these! Fun! Those rice krispie treats look fabulous! And we need to try fruit kabobs. Thanks for sharing at the Sunday Showcase. Love for you to link this up to Mom’s Monday Mingle. Hope to see you there!